The Orange-and-Blacks are leading the standings, being ahead of Zoria and Dynamo by 5 and 6 points respectively. This intermediate result is the main motivating factor for Paulo Fonseca's squad. 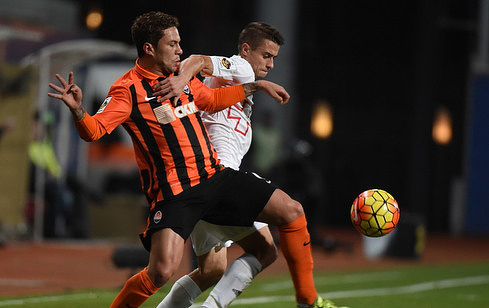 Shakhtar need to win to feel comfortable in the title race. On September 22 the Pitmen trained at Sviatoshyn base. Anton Kanibolotskyi, Viacheslav Shevchuk, Marcio Azevedo, Yaroslav Rakitskyy, and Darijo Srna trained in accordance with individual programme. The captain of the Orange-and-Blacks has already begun jogging. Due to the four yellow cards received in the course of the League, Shakhtar midfielder Fred will miss the upcoming match. The Lutsk team earned 5 points in eight rounds and is next to the last in the standings. Volyn is one of the two teams who scored the least in the League this season (6 goals). In the current season Vitalii Kvartsianyi's squad managed to get points in the matches against Zirka, Olimpik, and Oleksandriya. Thye lost their games against Dipro, Stal, Dynamo, Chornomorets, and Vorskla. Note that this Wednesday, September 21, Volyn held a match of the Ukrainian Cup Round of 32. The Lutsk team beat Olimpik Donetsk 2-1 in a home game. Due to disqualification Slovenian defender Micah Goropevsek, who played without substitutions in the previous rounds, will miss the game against Shakhtar. In total the opponents held 28 matches in the Ukrainian Premier League. Shakhtar won 19 times, Volyn - 3, and 6 matches ended in a draw. Goal difference: 66-23. There were 14 home games for the Orange-and-Blacks, 12 of which won by the Donetsk team with a draw and a win by Volyn"ce. Goal difference: 45-12. In November 2015, the Pitmen crushed Volyn in Zporizhia with a 4-0 score. A deuce by Marlosin the first half, and another goal by Imaiy. The fourth goal took place on 67 minutes by Oleksandr Gladkyy. Three of the last four matches in all competitions the Orange-and-Blacks won with the score of 1-0. Oleksandr Kucher may make his 275th appearance for Shakhtar. The Pitmen's scoring streak in the League started on August 28, 2015 and has lasted for 28 games (85 goals). You can purchase tickets for Shakhtar vs Volyn game at the ticket office of the stadium, or online at shakhtar.com or partner sites (kasa.in.ua, internet-bilet.ua, esport.in.ua, tickethunt.net), as well as in retail networks of Lviv.